Hello there! Hope you are enjoying the crypto revolution with the CoinSutra community. Today we are going to discuss one of the core concepts of Bitcoin transactions that will keep you ahead of others in the crypto race – the Unspent Transaction Outputs aka UTXOs. In the early Bitcoin days, this concept was considered pivotal. So much so that if you did not understand UTXOs correctly, you could have made a transaction you never intended to in the first place. However, in the present scenario, thanks to the way Bitcoin wallets work, especially with the HD wallets, you don’t need to worry about understanding UTXOs as thoroughly. However, it is good to know the details which enable you to take care of your Bitcoins in a better way and also understand the jargon which is often mentioned while discussing Bitcoin fees. Let’s dive into it right away. A Bitcoin transaction is comprised of inputs and outputs. You always need a UTXO or an unspent transaction output to make a transaction. If you don’t have an unspent transaction output, it simply means you don’t have any Bitcoin. This mainly happens due to the protocol rules which Satoshi Nakamoto had defined in Bitcoin to prevent double spending. Also, there is no way in the bitcoin world to spend partial amounts while completing a transaction. To break it down further: If you have a balance of 3 BTC on ‘XYZ’ public address and you have to pay 0.5 BTC to a merchant, you cannot simply send 0.5 out of your ‘XYZ’ address and keep the rest 2.5 BTC intact. Instead, you need to spend whole 3 BTC out of which you will designate 0.5 BTC to the merchant while providing a signature and sending the rest 2.5 BTC back to yourself on an address that you control. This is called sending the change to the change address. You might be wondering that you never make two transactions in your wallet when you pay someone. Yes, that’s true because modern wallets take care of everything behind the scenes. In short, when a bitcoin transaction takes place, there are two UTXOs created: one that is the actual coins sent to the recipient, and one that is the change output, which goes back to the sender’s wallet. For more clarity, see the transaction above series which is probably done by the same person. 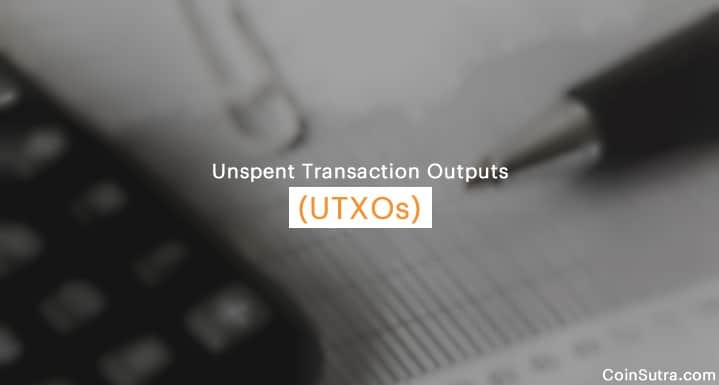 Through transactions 1 to 4, you will notice that all outputs on the right-hand side are a pair of (Unspent/Spent) amounts and in transaction #5 both the outputs are unspent amounts. 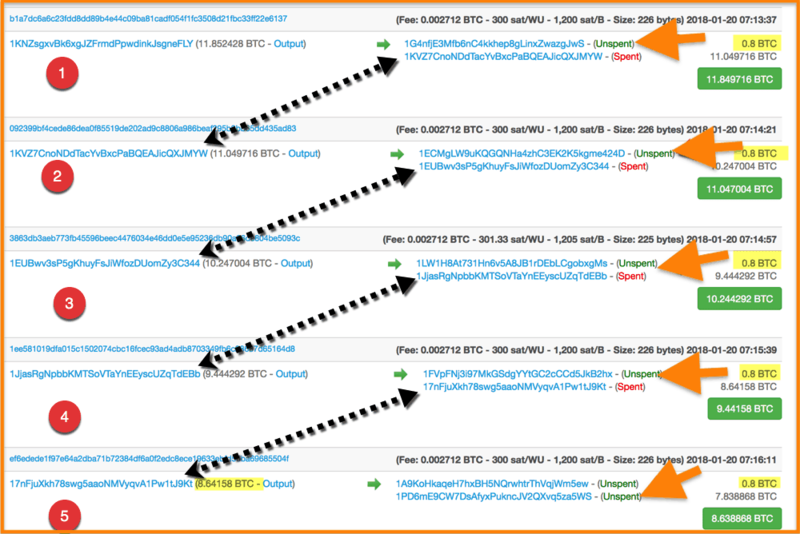 If you observe closely, in transactions 1 through 4, the user is sending 0.8 BTC repeatedly to another address starting from a net balance of 11.852428 BTC in the input of transaction #1. In all the 4 transactions, the remaining balance after the deduction of 0.8 BTC, plus the transaction fee, is returning to a new address, which is called the change address. These change addresses are nowadays generated automatically by HD wallets, much to your relief. And from these change addresses, in all the 4 transactions from #2 through #5, new transactions are initiated which is why they are labeled as (spent) outputs respectively (in number #1-#4). In the end, the original address that started with a net balance of 11.852428 BTC is now reduced to 7.838868 BTC after completing transactions of 0.8 BTC five times. The output of 7.838868 BTC is the UTXO of the sender or output which is unspent yet and the other 0.8 BTC is the UTXO of the recipient. Notice, on the right-hand side, the 5th transaction outputs for final balance and UTXOs). Lastly, if you notice, the public address of initial balance and the final one is different. This is why many people get confused when they see that their wallet address changes every time they make a transaction. This happens because HD wallets automatically send the change to a different change address so that you can secure your privacy. So next time you see you address changing, you know it is happening because you are receiving new UTXOs on a new change address! In earlier Bitcoin days, when there were no deterministic wallets, BTC wallets used to ask for a change address if you were not the spending the whole balance in the initiated transaction, failing which could result in your change being sent to addresses that you did not control resulting in loss of your funds. It is safe to say that you now understand how UTXOs or the change process is managed in Bitcoin transactions! Hope you liked this article and found it interesting. Please don’t forget to share this with your friends & family on Twitter and Facebook. How To Sign A Message With Ledger Nano S Wallet?